Last Friday night I was sitting in a Chicago hotel room and had just paid $10 to access the internet. I opened my Gmail and there were about 100 more emails than I was expecting. Our book’s website had an extra 5,000 pageviews and JuniorBiz boasted an extra 2,000 pageviews. After a few minutes of Sherlock Holmes-ing, I realized that “finance.yahoo.com” had sent a couple thousand people to our sites. It took me all weekend to figure out what happened. 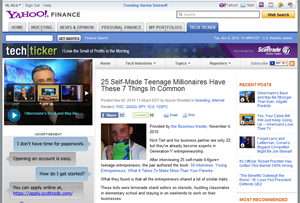 Here’s the down-low on how we got on Yahoo’s homepage, the fourth most popular website in the world. 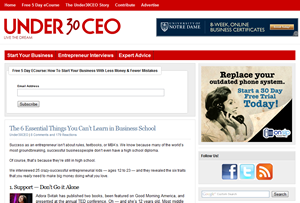 Scheidies's original guest post on Under30CEO. A few months ago my friend, Matt Wilson, tweeted me because he found our book and wanted to feature it on Under30CEO. So Scheidies spent an afternoon at the local coffee shop writing a classy article for Matt’s site. After a few days of being on Under30CEO, with the article earning a couple hundred tweets and likes, Matt decided to repost it on another massive site. You can see the original guest post here. 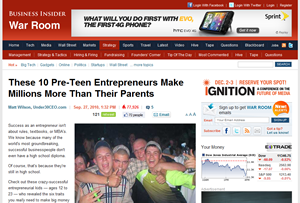 Guest post reposted on Business Insider. Since the article was doing well, Matt contacted Alyson Shontell at Business Insider (an Alexa top 900 site) to have the article featured there. Within a day, it received 70,000 views. 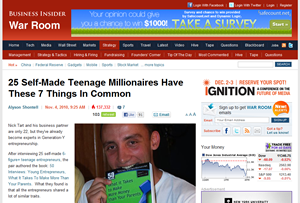 Andrew Fashion interview on Business Insider. Since the audience on Business Insider took so well to the article about our book, Alyson reached out to me asking if she could put our interviews on Business Insider. On Thursday, October 14th I sent her Andrew Fashion’s interview to post. An hour later, it was up. Within an hour it had 12,000 views. By the end of the weekend it was up to 80,000 views. Andrew’s interview was also picked up by Gawker (another 100,000 views) and MSN. Since, Andrew has been interviewed by The Times UK and an Australian news show. You can see his interview on Business Insider here. I wanted to know how to do this again and Alyson wanted to know more about our book. So we set aside some time to chat last Tuesday. About 15 minutes into the conversation, Alyson mentioned that she’d like to transition our chat into an interview so she could make it a post. So I started using bigger words. On Thursday, she posted the interview on Business Insider here. The interview on Yahoo! Finance. My interview with Alyson received about 60,000 views that day. 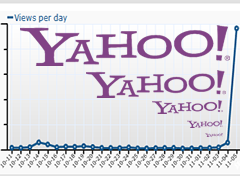 Because Business Insider is such a large site, someone at Yahoo! saw it and reposted it on Yahoo! Finance late Thursday night. 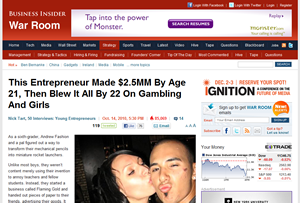 The next morning, two of my friends said they saw it on Yahoo’s homepage. By the end of the weekend it had over 400 comments and God-knows how many views. You can see the article on Yahoo! here. Yeah, we got really lucky that Yahoo! 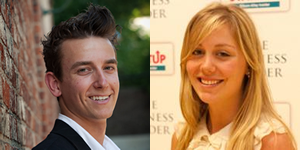 decided that our interview was worthy of their audience, but it wasn’t an overnight success. We spent months contacting some of our interviewees to make sure we created the best book we possibly could. I’ve known Matt for years and that’s why he wanted to help. Scheidies tore through every word in that Under30CEO guest post for hours when he could’ve pumped it out in 30 minutes. It may have happened overnight, but much like our interviewees, this overnight triumph was years in the making. 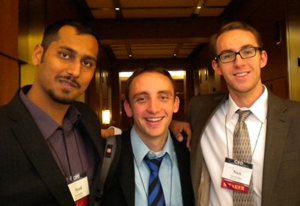 Nick and I in Chicago with Syed Balkhi. Late last night I went through most of the 400+ comments. A lot were negative but most were encouraging. One was from someone I went to high school with and another was from someone who purchased our book. Today, I’m finally caught up on book orders, those 100+ emails, and sleep deprivation from our trip to Chicago. Later this week I’ll post more outcomes. Stay tuned!